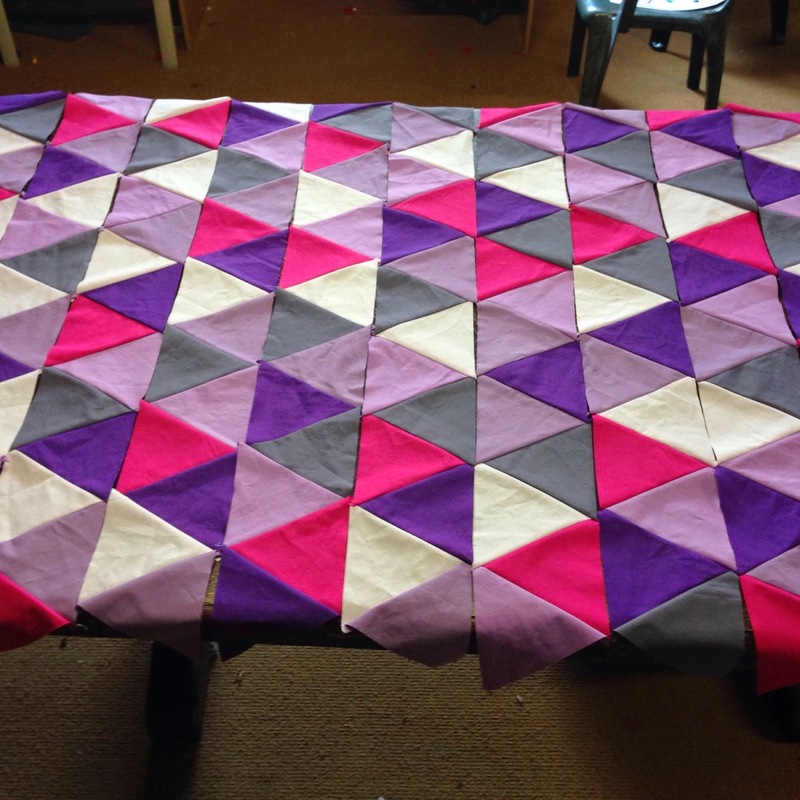 I got all the rows of triangles sewed together on Monday night. And then I spent an hour shuffling the rows around on Tuesday afternoon, trying to come up with the grouping that didn't have any diamonds showing, because randomly selecting triangles and rows still results in patterns! I can't wait to start sewing the rows together (although who knows when that might be, new sleep routines & new husband routines all take time figuring out) and see how this quilt comes together. But how should I back it? I originally bought the butterfly fabric for the back, but the cream doesn't quite match. 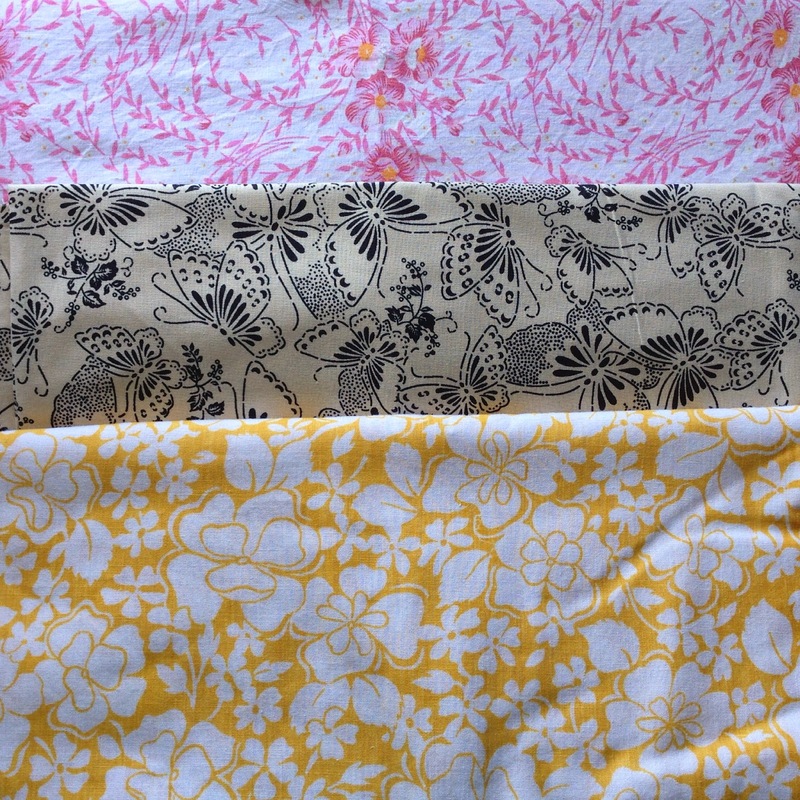 Then I thought I might cut into my vintage sheets (both the yellow and pink are from that stash), but now I'm not quite sure. The binding is going to be a darker grey. Do you make quilts? Or do you sew? I think the butterflies would work fine? Then creams aren't going to be close together. I love how the top is looking! I think I'd go with the pink sheet. But the cream would work fine too. Can't wait to see it finished. I hope you get some time to work on it soon. Lovely purples! I'm a 'matchy' quilt backer....I'd find something else. I don't quilt . . . but I come from a long line of quilters. I have a quilt with those same triangles in rows that my Mama made for my Grandma . . . in various shades of purple!! So this post totally brought a smile to my face. I vote for the pink vintage sheet for the back! It is coming along beautifully, Cate :) I think the butterfly one will work fine but I really like the top one since it's for Sophie. Love the butterflies, I'd still use them.